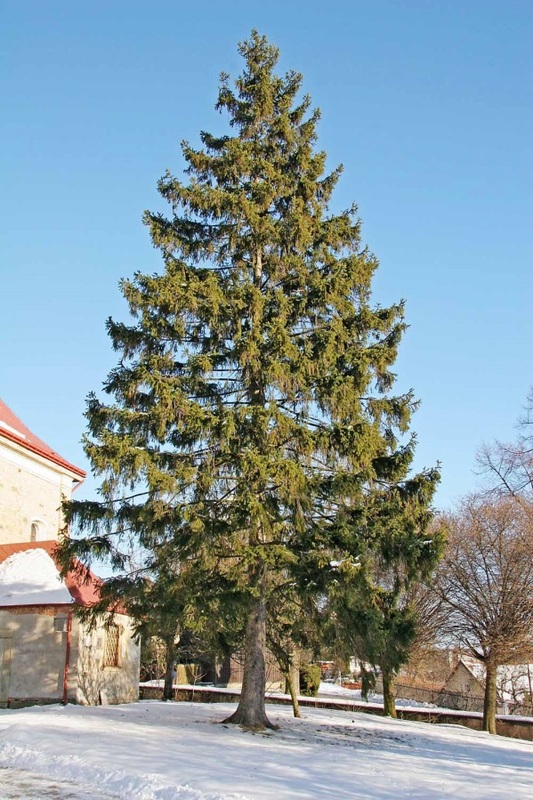 Picea abies is an evergreen gymnosperm tree to 30 m tall, bark rusty-brown, flaking, habit pyramidal, branches droop, secondary branches pendulous, as if draped along branches, young trees with stiffer habit. Leaves: Needles, dark green, about 2 cm long, stiff, straight. Flowers: None; gymnosperm; cones monoecious, males short, red, females about 12 cm long at maturity. Scales thin. Fruit none: seeds wind dispersed. Habitat: Around old house sites; rarely escapes into forest understory. Very common horticultural tree, especially in suburbs. Tolerates a wide range of conditions.